When Indonesian authorities seized a notorious fishing boat last April carrying 30 kilometers (18 miles) of illegal gillnets,they found they had essentially caught a ghost. The STS-50 had gone by other names in the past — Sea Breeze, Andrey Dolgov, STD No. 2, Aida — and flown the flags of eight separate countries on different occasions. It was under one of those guises that it had been detained by Chinese authorities, only to get away. It was later seized again, in Mozambique, but slipped away from there, too. Its entry in Lloyd’s List Intelligence, the Facebook for commercial ships, features a nebulous web of companies, some registered in offshore tax havens, whose ownership is virtually impossible to determine. The list identifies Marine Fisheries Corporation Co Ltd as the registered owner and Jiho Shipping Company Ltd as the beneficial owner. Other firms it was previously registered to include Red Star Company Ltd, Dongwon Industries Company Ltd, STD Fisheries Company Ltd, and Suntai International Fishing Company. The STS-50 fishing boat. Photo: Indonesian Marine and Fisheries Ministry. Accountability for the vessel’s illegal fishing activities went no further than its Russian captain, who was fined just under $14,000 by an Indonesian court. The case of the STS-50 is emblematic of the key obstacle in Indonesia’s otherwise robust fight against illegal, unreported and unregulated (IUU) fishing, says Susi Pudjiastuti, the country’s highly regarded fisheries minister. As with the STS-50, she said, the names kept changing, along with the flags they sail under. Susi has overseen an ambitious fisheries enforcement program since taking office in late 2014. This includes seizing and blowing up illegal fishing vessels, banning fish transfers at sea, imposing a moratorium on permits for foreign boats, and prohibiting the use of trawl and seine nets. The minister has famously attended the sinking of some of the 488 vessels scuttled since October 2014, most of them foreign-flagged and owned. These tough measures have proved effective in helping replenish fish stocks in Indonesia, home to the second-biggest marine capture fishery in the world. Domestic fishing, dominated by small-scale and artisanal fishers, has grown significantly as a result. 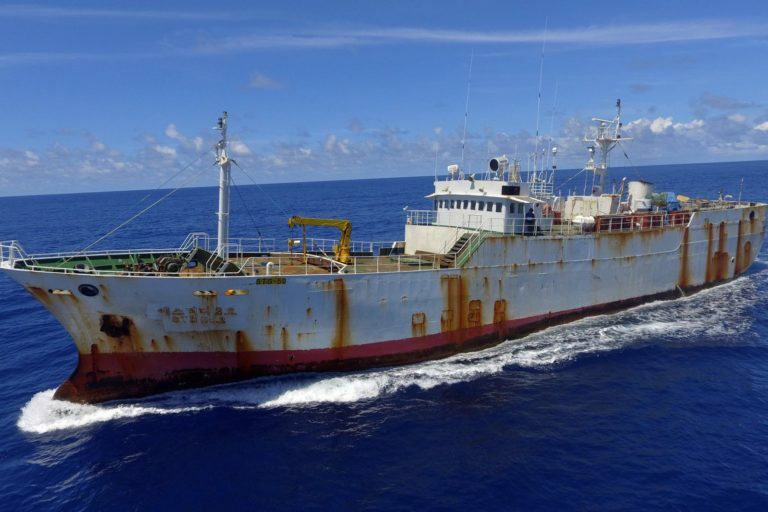 But the inability to go after the ultimate owners and operators of vessels engaged in IUU fishing clearly irks Susi, who says the practice of obscuring ownership isn’t limited to foreign-flagged boats. Indonesian fishing companies are known to register their vessels under the names of “a chauffeur or pedicab driver,” she said. “The owners don’t want to have their names listed,” she added. Another ploy is to operate several boats under a single permit, in violation of Indonesian law that requires owners of vessels of more than 10 GT (gross tonnage) to obtain a permit from the fisheries ministry. “So when we make an arrest, it’s not necessarily the people who benefit from all these illegal fishing activities” who face punishment, Susi said. To target the corporate and beneficial owners of illegal fishing boats, Susi has called for an international consensus to include IUU fishing activities in the United Nations Convention against Transnational Organized Crime (UNTOC), also known as the Palermo Convention. Activities currently recognized as transnational organized crimes under the convention include human trafficking, migrant smuggling, and gun trafficking. Last October at the 4th International Symposium on Fisheries Crime in Copenhagen, Indonesia was one of 15 countries that approved the International Declaration on Transnational Organized Crime in the Global Fishing Industry. “If we can get [IUU fishing] classified as a transnational organized crime and approved as such by the world, we can partner with each other, for example, to extradite the owners,” Susi said. Without formal recognition of its transnational nature, fishing crime can only be prosecuted in the jurisdiction in which it occurs, or, as in the case of STS-50, through cooperation via Interpol. On the domestic front, Susi said she would strive to boost Indonesian law enforcement authorities’ ability to prosecute the corporate and beneficial owners of illegal fishing vessels. In 2016, the government established the International FishFORCE Academy of Indonesia (IFFAI), which trains prosecutors and judges in fisheries law, to encourage them to pursue the maximum punishment allowable against vessel owners in order to create a deterrent effect. The ministry has also been working to get a revised bill of the country’s fisheries law to include a provision on punishing corporate and beneficial owners, Susi added. Activists have long called for such a provision, which they say will be key to efforts to stamp out IUU fishing in Indonesia. But Arifsyah was skeptical about the bill being passed into law anytime soon, noting that both parliament and the government were preoccupied with the upcoming legislative and presidential elections in April. “Without revising the fisheries law, it’ll be very hard to punish the owners, regardless of the evidence against them,” Arifsyah said. Despite the challenges, Susi said she would continue raising awareness and educating all stakeholders about the importance of tackling IUU fishing and striving for a sustainable fishing industry.